Vacationing On A Budget? Travel Tipid Tips Here! Who loves travelling? I do! Who loves budgeting? I do too! Having a family of my own means, I now do more of the latter, than the former. But since I have the burning desire (lalim ng desire!) to conquer the Philippines and hopefully the rest of the world, I still do travel once in awhile, but this time, I travel on a budget. 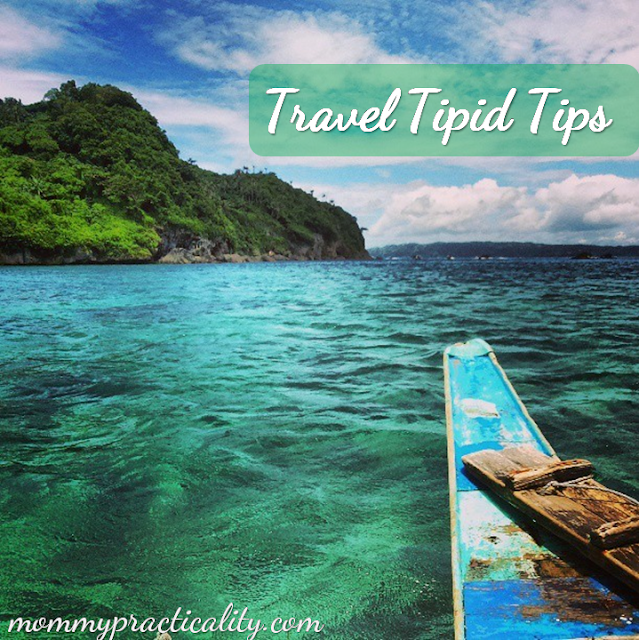 I used to search on travel tipid tips online from moms like myself and I find just a few. So I want to share with you my Mommy-Budget-Travel-Tips because I know that most moms want to have a family vacation but are worried about its price right? As I write this, I'm still having a wonderful hangover from our recent family vacation to the island of Boracay where there were more Koreans than Filipinos at the time. Not that I have anything against Koreans please, but it just felt awkward to be surrounded by more tourists than your kababayans. It felt like we were the foreigners. There was even a time when we ate at a restaurant, we were the only Filipino customers, all the rest were Koreans. Anyway, going back to the subject, my Travel Tipid Tips, alam niyo po ba that apart from my slashie-roles, I also love travelling?! Isa po akong Lakwatsera. Layas. Kaladkarin. Hihihi! I love experiencing new places and meeting new people. I love learning about different cultures from other cities or provinces. I love the beach. I get an overwhelming feeling whenever I step on a new town or a new country. I love it more when I get to travel without spending too much! Yes Muthers! You can travel with your family and actually enjoy even when you have a right purse. You just need a perfectly planned itinerary and the discipline to stick to your set budget. To be more concrete on this, here are my travel tipid tips for you. Book flights from Airfare Seat Sales. - Heard of the tagline Now Every-Juan Can Fly from Cebu Pacific? They made budget airfares possible so we could be tour of our own country. There's so much to explore in the Philippines my dears! This was followed by PAL, Air Asia (formerly Zest Air), and SEAir too. Watch for PISO or ZERO seat sales during holidays like Independence Day, Araw ng Kagitingan, etc. From let's say P7,000.00 one way ticket price down to P1,000.00 per person, I guess that's a great deal right? Travel Off-Season - Best time to travel when going to the beach like Boracay is during off-peak season. You could save a lot on your hotel accommodation. Most of the hotels there charge almost half their peak season's rates. Travel light - Avoid paying for excess baggages. Make sure you pack smartly and of course lightly. Remember on your way home, you will still be bringing more baggages due to your pasalubongs. If you can just handcarry your luggage or backpack, the better. Saves time in waiting for your baggages to come out from the airplane too. Scout for best hotel packages/compare prices - Since most of the budget fares become available few months before your actual travel, you still have more than enough time to search for the best hotel packages. I suggest if bringing children with you, choose a hotel with swimming pool so they have something else to do in case they don't want to hit the beach. Remember to compare prices of hotels. You could get great deals if you're patient enough to do your research. Go by the per night charging rather than per person charging. Read rates carefully. When booking, better to call their reservation office for clarifications. Read and abide by hotel rules and regulations. Almost all hotels charge for stained mattresses, pillows, towels and broken or lost items. Take note of the check-in and check-out times. You might pay additional if you checked-out late. Plan activities ahead of time. - Research on what activities you could do in your travel destination. Is it island hopping? City tour? Zip line, banana boat, Zorb, Paraw-sailing or anything? Decide what you want to do or not want to do. Know their approximate rates. Ask yourself as well, are they worth it? Will you or your kids enjoy them? Are they safe to do? Do you have extra budget to do them? If most of your answers to those are NO, then better not pay for these extras. Sometimes it's also nice to take a quiet stroll on the beach, sit and read a book or just simply enjoy the water and commune with nature. List down daily expenses to monitor your budget - Ever since I started travelling, I always bring a small notepad and a pen with me. I list down ALL, as in to the very minute spending, expenses for the day. This way, I would be conscious of my spending, how well I do in managing my budget, how much budget left, if there will be an extra, and in which expense type should I tame my spending. I know OC noh? But it really helps to track your expenses. Learn to haggle/negotiate - For item #6, should you opt to try any activities and talk to boat owners for island hopping or other agencies for the other activities, you should learn to haggle to get the best deal. Sometimes they overprice their rates. If you show them that you ask others for their rates, they compete with each other and so could get the best rate among them. Just make sure, there are no hidden charges anymore. When buying pasalubong from a local store, you can always haggle. Pababaan na ng presyo to! Tip, when they say P100 for a piece of shirt, haggle up to half its price! OA lang diba? They will still be able to give you a price lower than P100. Nakatipid ka pa rin. Research on inexpensive restaurants - In Boracay, I planned a day or two to eat at inexpensive restaurants such as Andok's, Mang Inasal's, McDonalds and nearby carinderia. A special day or two (depending on your length of stay) at D'Talipapa where we market the meat and have it cooked by the "paluto" restaurant. This way, you could stretch your budget wisely. Refill your Water Bottle with hotel's supply. - It's important to hydrate yourself and your kids throughout the day. Buying bottled water may be quite expensive in some stores, so why not bring a water container and refill it with the hotel's drinking water supply. You save a lot of money just by doing that. Ask friends for tips about your destination.- When in doubt, it's also best to ask friends for tips on where to go and what to do and also how to save on your trip. Of course ask a reliable budget traveler friend, so you not only save on money but also on time. Having these tried and tested Travel Tipid Tips make travelling fun yet friendly on the budget. It takes a some planning, researching and strokes of discipline. You don't need to be very rich to see the world or at least see how beautiful our country is. Travelling actually makes one richer. Richer in experience, life perspective, geographical knowledge and also in friends. So start planning your next travel destination with these easy to do travel tipid tips! Safe travels loves!